The president of the anglophone separatist movement in Cameroon, Sisiku Ayuk Tabe, was extradited to Yaounde on Monday after being detained in Nigeria, the government said. Ayuk Tabe, who had been held in Abuja since January 5, was sent to Cameroon with 46 of his supporters, Cameroonian government spokesman Issa Tchiroma Bakary said in a statement. “A group of 47 terrorists, which includes Mr Ayuk Tabe, has been in the hands of the Cameroonian justice system for a few hours,” Tchiroma said. “They will answer for their crimes” before the Cameroonian courts, he added, underlining the “determination” of Nigeria and Cameroon “never to tolerate that their territories serve as a base for destabilising activities directed against one or the other”. Prior to their extradition, Ayuk Tabe and nine others had been “held in secret” at a hotel in Abuja, according to their lawyer and Amnesty International. It was not possible on Monday to establish when the other separatists extradited from Nigeria to Cameroon were arrested. In mid-January, Amnesty International expressed concern about the separatists detained in Nigeria, saying they “could be threatened with torture and (given) an unfair trial” if they are extradited from Nigeria. Over the past year, there has been mounting tension in Cameroon’s Southwest and Northwest regions — home to anglophones who account for about a fifth of the West African nation’s population of 23 million. English-speakers complain they have suffered decades of economic inequality and social injustice at the hands of the French-speaking majority. Ayuk Tabe is campaigning for the two English-speaking regions of Cameroon to separate from the French-speaking part of the country. 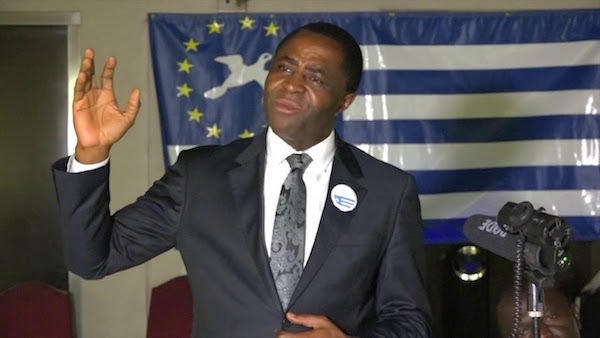 On October 1 last year, the breakaway anglophone movement issued a symbolic declaration of independence for “Ambazonia”, claiming autonomy over English-speaking regions. Cameroon’s President Paul Biya fiercely opposes secession and has met the agitation with a crackdown, including curfews, raids and restrictions on travel. The country is preparing for general elections — including the presidential vote — at the end of 2018. But observers say the ballot could be disrupted by the deep socio-political crisis in the English-speaking regions.